Artful Affirmations: Gifts from Linda! I was recently blessed with gifts from a very talented artist named Linda, from Blue Eyed Girl. She is an amazing fiber and graphics artist, and I enjoy visiting her blog and seeing what delicious things she is creating. A little while ago I saw that she was creating her own soothing cream as well. It sounded so good, I asked if I could purchase some. Instead though, she asked if she might gift me with a jar of it....well YES! How generous of her! Linda works with such vibrant colors! Here is a gorgeous pin she sent along with her cream. This is going on my favorite sweater and my winter coat! Linda sent along some of her own stunning fibers! Look at those colors! Lastly and not least, is the card she made me. She put an image of her own antique tea cup on it! What a creative way to share it with me! Isn't it a beautiful cup? Thank you so much Linda! I so totally appreciate your creative gifts! 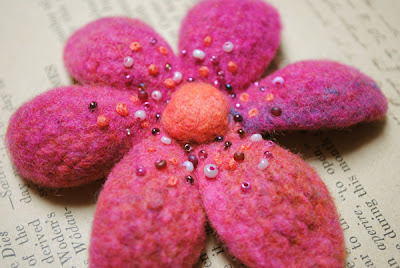 I adore the colors Linda works with, and I was inspired to begin a new project that I am using some of her fibers in. Below is a sneak peak of it. It is part of the new venture I mentioned in my last post. 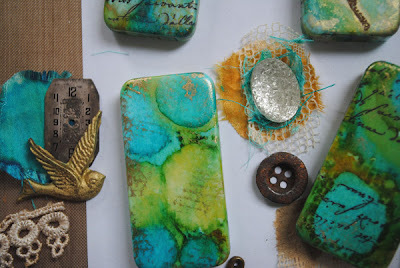 I will be teaching a mixed media class on Alter Domino Books at Creative Workshops ,(a wonderful online community!) this fall and I am very thrilled and excited! I was delighted and honored to be asked by Gail to join such a fine group of artists. I love teaching online as any one any where in the world can come together to have fun! As you know, I do videos for free on a regular basis and I love doing it. I had been wanting to do a domino video, but it became a very large venture, as it has about 8 videos to it! So I thought that it would be a good fit with Creative Workshops. I will continue to do free video tutorials too. I have some new ones coming up for this fall. Lots of fun! Oh Terri what lovely gifts u received. I luv those colors in the fibers. Wishing i lived in tenn so i could take ur class. Linda is truly generous. I'm going to have to visit her blog to see about that cream, too. Lavendar is my favorite...I put on lotion every night before sleeping. LOVE the fibers she sent that you will be using. The colors you picked are so pretty...nothing like turquoise to put a smile on your face. It's such a happy color. I for one will be waiting for your Creative Workshop class announcement. Congratulations on being asked to participate at such an outstanding place to create. I hope your day is going well. My week had been packed with things...but next week is quieter. Maybe I can get some art done then! Oh Terri, you received beautiful, thoughtful gifts for sure. And I always love your tutorials. I checked out the Creative Workshops they have going right now and oh! I want to take them all! Including yours when it comes up! You do beautiful work and your last photo looks so intriguing, can't wait to see the results! Lovely gifts from your friend. I am excited to see that you are going to do a tutorial on the domino books! I will be signing up for that. Yay Terri! How beautiful..such wonderful treasures to receive! and yay..i look forward to yoru dominos.they are so pretty...yay..you are so talented! I can smell the goodness through the screen. Mm, mm, mm! Congratulations and Best wishes on your new venture. You are a generous soul yourself and a wonderful teacher. Exciting news on your new adventure at Creative Workshops! I hope Gail sends out an email when your class starts I would love to take it! I love the format over at Creative Workshops because you can finish at your leisure and keep going back if you forget how to do something~ for most of the classes! Terri, I don't have a dremel. Oh, you deserve all the beautiful things that come your way my friend. You are a gentle soul and you are an inspiration to many. Sorry I haven't been around much, am trying to get back to my friend's blogs. Hugs! That pin is a lovely and thoughtful gift that will be marvelous on a sweater or coat. And, just look how the works of one artist inspire another - that's what I love about the arts - such a free exchange of ideas that feed us and make us reach for the next creative thought to bring to life! I'm looking forward to your new tutorials. Your dominoes are fascinating, too - such detail and an unusual use for them. Who'd a thunk it! lovely gifts Terri and adore your green creations on your desk. what wonderful gifts -- love the colors! And that card is stuning! Mmm, the cream sounds lovely and the pin is gorgeous.....lucky you!! that is really a loving gift with all this cute things from Linda. I can imagine how wonderful the cream is and the pin is really adorable. But the card is a real treasure and so perfect for you. Wish you lots of fun with the beautiful gifts. 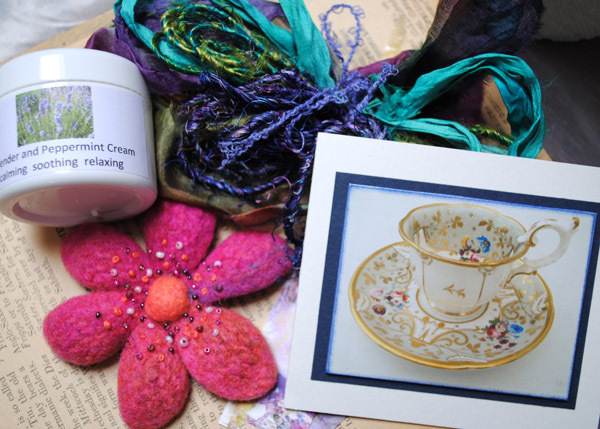 Teacups, art, & fiber, my kind of combo. Her fiber art is lovely and inspiring! A lovely selection of gifts. Your class sounds great - congratulations! Those are wonderful gifts! You are so deserving. I am looking for Tea Cup Tuesday and can't find it! I got the most wonderful teacup from a lovely blogger! I love your gifts! New lotions and potions are a favorite of mine. Puts you in a different mood! :) The flower pin is adorable. I love your collection of items on your desk. Looks like an interesting project coming. Oh such fun Terri! It so nice that you were gifted...you are a very giving person! Thanks so much. The pin is beautiful - what fun to receive the gifts. Terri. The lotion sounds pampering and relaxing. 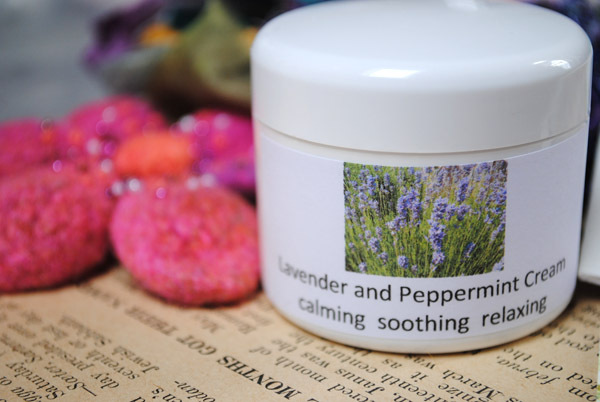 Lavender is most relaxing...just smelling the sprigs can bring about total calm and peace. I love your blog. I always get such great ideas from your work. Hi Terry, I am always inspired by your beautiful entries and your creativity, I hope you enjoy your gifts, hugs. Rose M.
wow terri i would love to be in this givce away.. and wish i could take the class too... thanks for always inspring me..with your creativity.